We’d love your help. Let us know what’s wrong with this preview of Where Shadows Lie by Tialla Rising. His dark past haunts him. His new life taunts him. After twenty years in the gangs and a hefty prison sentence, an early release gives Shawn the opportunity to turn his life around. But that isn’t so easy when gangs are involved. Only a year into his fresh start, the gang catches on and makes Shawn’s life miserable. After all, once a gang member, always a gang member. His His dark past haunts him. His new life taunts him. Only a year into his fresh start, the gang catches on and makes Shawn’s life miserable. After all, once a gang member, always a gang member. His very blood belongs to them. Threats become promises. Whispers become actions. Words become bullets. He must fight – not only for his life, but to save his honor, prove his integrity, and protect the woman he loves. An ember of hope glows in the darkness, strengthening his resolve. Will her support and his determination be enough to dispel the shadows of his past? To ask other readers questions about Where Shadows Lie, please sign up. This was a very different book for me to read. I like to jump out of my usual choices so that reading becomes varied for me and I can jump back to each genre refreshed. And take each book in each genre with a clear outlook again. This is [among other things] the strength of the pull, the commitment the loyalty to get out of gangs. We are not talking of little clicks of youths, we are talking Gangster gangs, really serious 'life on the line' type gangs. Get mixed up with them, fall out with them a This was a very different book for me to read. I like to jump out of my usual choices so that reading becomes varied for me and I can jump back to each genre refreshed. And take each book in each genre with a clear outlook again. This is [among other things] the strength of the pull, the commitment the loyalty to get out of gangs. We are not talking of little clicks of youths, we are talking Gangster gangs, really serious 'life on the line' type gangs. Get mixed up with them, fall out with them and your 'dead' kind of gangs. Shawn was really heavily into the gang, until he was put into prison. He then had a chance to turn his life completely around. But what when he got out? Now that he is out he refuses to go back. But is the gang going to leave him alone? Will they just forget about him and allow him to move on? You bet your bottom dollar they won't. There was this girl he was close to. Renewing their friendship he realizes its not just "friendship" he has fallen for her. He is an ex gang member and how does she know he is different now? she is a Christian and has values. She turns out to be his rock. One night, things get dangerous, this leads to and attack. This was a very well thought out story, the characters were solid as a rock, they really were 'real' to me. The anguish, the emotions, the empathy I could feel for Shawn was immense. He really was different, and proving that was well written by the author. I don't know much about gangs like this, only what I read and hear. That's as far as my knowledge goes, however, its quite scary to think young persons can get involved in this type of thing and end up maimed or dead because they want to leave the gang membership. Gangs against gangs, each has their own 'morals' of conduct. There was nothing at all that lacked her for me. It truly was a good read. A pretty great story about redemption, how the past affects your future, a mystery, and some romance. Recommended 14+ for violence, gangs, scary situations, lots of hospital visits, and missionary dating (don't do it kids, it's not worth it). Shawn Parrino left the gangster lifestyle four years ago. Following an imprisonment, he returned to his hometown of Arrowhead, and tries to start a new life. He didn’t have many friends; his best friend and girlfriend Virginia, her brother Bryan, and another ex-gangster, Jackson, are about it. Besides his next door neighbor, Mrs. Jenson, and Virgina’s cousin Joy, no one really cared anything about Shawn. Except, the gang he left behind. He had hoped they would just forget him, but their motto, “Blood in, blood out,” was more than just a saying. It was reality. A reality that got slammed into his face just when he least wanted it. Thirsting for revenge, as well as to appease their boss’s personal vendetta, the gang known as The Shadows, chase after Shawn, trying to break him to their will. When he won’t yield, the boss decides to go after the few people that Shawn loves. Miss Rising is very good at building her ‘world’ for the reader. Arrowhead and the surrounding area is very easy to picture. She also manages to describe it without long and detailed descriptions, instead allowing it to flow naturally into the narrative. She also describes emotions and pain very well. The reader’s heart wrenches when one character finally breaks down sobbing or holds their breath as another slowly loses consciousness. Pain or sorrow feels very real. On the other hand, certain aspects of the book felt like they could use some more research or realism. Things like recovery time after injury or how the police operate. Some areas of the book felt very unrealistic. I liked Miss Rising’s characters. I liked their connection to each other. Even so, I didn’t like some of their behavior. Another area that felt very unrealistic is the danger these characters would put themselves into. Danger that could have been easily avoided, if, for instance, Virginia has listened to Shawn a little more often. Yes, they usually managed to survive the danger – sometimes just barely – but it felt so needless, all too often. More on that in a minute. The dialog felt stilted at times, but I liked the way they communicated. Miss Rising did letting the character’s relationships shine through the dialog. Not something that everyone is good at. I did like the strength of Bryan and Virginia’s sibling relationship, as well. There are a couple of things that bothered me, but don’t read if you don’t want some spoilers. Nothing from the conclusion, just a few aspects of the book. I know the author’s intent with showing the escape of the main characters from so much danger was likely to show how miraculous the protection of the LORD can be. I get that. However, the LORD is not an insurance policy to allow us to run our heads stupidly into danger. He doesn’t usually work like that. I appreciate what Miss Rising was trying to communicate, but I can’t help but think it needed to be shown in a different way. God does often show mercy and gives us protection, but it doesn’t usually look like a young woman going into Gang City Central, on foot, alone, and unprotected by human standards, with a pending death threat on her head from the main gang living there, justifying her actions by saying that the LORD will take care of her. The way Virginia broke off her relationship with Shawn also bothered me. She knew better than to enter into a romantic relationship with an unbeliever. She knew better beforehand and those close to her made sure to warn her about it, but she justified and defended herself. While this was shown to be wrong – and I applaud the author for that – Virginia kicked Shawn out of her house the first time he openly questioned and showed his disapproval of the LORD’s doings. Do I think Shawn was in the right? No. But I don’t think Virginia was in the right either. Besides, she hurt Shawn deeply by agreeing to date him in the first place – and this was never really acknowledged. There was some violence and several deaths in this book, besides some rather intense situations, but being as it is a Thriller, that is probably to be expected. I wouldn’t give it to young children, but the book never goes into anything truly gory or overly descriptive. Even the deaths are handled with care. I received this book as part of a book tour to give an honest review. I normally do not read Christian type books and it isn't because I don't believe but I don't enjoy reading a book that has religion stuffed down my throat. This book was far from that. Yes God is talked about in the book and there are questions that Shawn ask which I have asked myself about the way God works but you don't have it feeling overbearing. 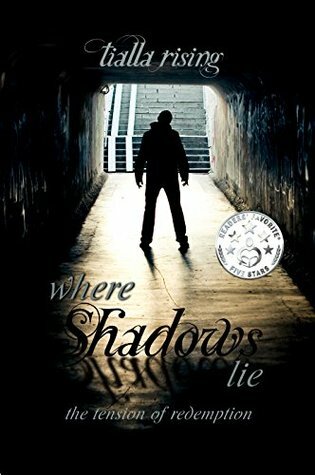 Shawn has a past of dealing with the gangs mostly The Shadows they ar I received this book as part of a book tour to give an honest review. Shawn has a past of dealing with the gangs mostly The Shadows they are a ruthless gang that rules a majority of Arrowhead. When Shawn comes back from prison he wants to change his life around which I think is great. Though the gangs motto is Blood In, Blood Out the question arises is will Shawn ever be free of them. While out he meets up with someone who knew him before and her name is Virginia. Virginia believes in God and knows everything is in his control. When Shawn gets stopped by a former gang member and Virginia steps in this leads a chain of events that you have to ask yourself if both Shawn and mostly Virginia are lucky or is it God looking out for them. These two try learn that they need to build a relationship with God as their center point of everything, and that everything will work out soon. Shawn is a unbeliever until towards the end and you see how he finally breaks down and ask for help because he knows he can no longer do anything on his own. We all know that sometimes things have to get worse before they will get better Shawn and Virginia happen to have this happen to them both. The only thing that bothered me was some of the things didn't feel real enough, One of them being Virginia gets burned pretty badly but yet she doesn't have to take care of the burns or anything? I know second degree is nothing compared to a third degree but I would have imagined that she would have had to take care of the burns in some way and this was never brought up. This is a love story in a way filled with action, people being deceiving, learning that you don't always have to have revenge. This was the first Christian book in this genre I have ever read. I was pleasantly surprised at the obvious research bigstock-Urban-Alley-At-Night-30383132and hard work the author did to write this book. The characters were usually easy to relate to. I liked Bryan the best, even though he was a minor character. Virginia and Shawn were good, too, but Bryan just struck a cord with me. Maybe because we're both the oldest. There were a few times when the characters seemed a little forced or two-dimensional, but that didn't happen often. The good characters all had flaws and the bad characters had some good aspects, especially the villain. Tialla did a very good job with the dialogue. Each character had a unique voice and always said things realistically. There were a few typos that diminished the reading, but nothing awful. Other than that, the writing was very good. There were a few times when the story dragged a little and other times I didn't want to put the book down, but had to. If you like stories about redemption, mystery, and don't mind some violence, this book is for you. The violence isn't awful and certainly isn't graphic, but it is still there for the imagination to pick up on if you allow it to. I loved this book, but... there was a ton of violence and blood and gory and... it was a bit extreme. :( The main characters "die" like five times each. But besides all that, I LOVED it!!! The one thing I especially loved was the writing style. The author did an amazing job with the characters expressing themselves. And the details; AWESOME!!! It was obvious that the plot was well thought out and that helped a LOT! The one thing that was disappointing was the ending. For over 400 pages the book ju I loved this book, but... there was a ton of violence and blood and gory and... it was a bit extreme. :( The main characters "die" like five times each. Cliffnotes version: Shawn is starting a new life after escaping from a local gang only to find that the gang (named The Shadows) won’t let him go, putting his new life and his new found family (consisting of his girlfriend Virginia, her brother Bryan, her cousin Joy, and his best friend Jackson) in jeopardy. Told from a mix of first person and varying third person narrations, the story is presented from many different perspectives all with the same personality, voice, and structure. I was bored. Cliffnotes version: Shawn is starting a new life after escaping from a local gang only to find that the gang (named The Shadows) won’t let him go, putting his new life and his new found family (consisting of his girlfriend Virginia, her brother Bryan, her cousin Joy, and his best friend Jackson) in jeopardy. Told from a mix of first person and varying third person narrations, the story is presented from many different perspectives all with the same personality, voice, and structure. I was bored. More than that, I was annoyed. We were treated to third person limited but mostly objective which made it hard to understand what the characters were thinking and feeling – the whole point of seeing this story from multiple perspectives. The language itself was stale, stagnant and emotionless. We were told a story, narrated then repeated over and over again until I wanted to walk away. I was constantly asking myself: “Do I need to know this?” and “Does this actually matter?” Usually the answer was a resounding “no”. And I just could not bring myself to care about the protagonist. Shawn’s character was whiny and superficial. Like an idealized version of the modern anti-hero. It didn’t help that his girlfriend was near perfection as the “preacher’s daughter” architype and the rest of his family were just drawn out stereotypes (Joy, made me cringe with her naiveté). The plot was nothing special, I even found the character’s attempt at renewal to be uplifting, but the language and the completely repetitive nature of the show left me begging for more action. · That’s not…what time period are we in? · No seriously, what time period is this? · Oh my god, I’m reading a Disney Channel movie, aren’t I? · Was it necessary to switch perspectives? · Ugh, how old are you? · Thanks, Yoda. Wait, is he training to be a Jedi? · What kind of jungle do you keep referring to? · Seriously, is it sexual? · So these guys just hang in the shadows waiting for people who might walk by? · WE KNOW! WE WERE THERE! · Oh my god, how did she get to adulthood? · Seriously? What century are we in? I will start with what I disliked. I felt like the plot dragged too much. The gang members never sparked fear inside me and it was a big let down since I love to read books about them. I didn't like the dialogue, it wasn't as deep as I wish it to be. That fact alone prevented me from connecting with the characters and believing in their relationship. I couldn't pinpoint the difference about the relationship they had with each other from other people. I never once believed the main characters were in danger... they just didn't act like people whose life is threatened would. They sort of just shrugged it off most of the time. The gang leader, Max, is set up as this badass who sparks fear in everybody but honestly, what I saw didn't cut it for me. He kept failing too much that I just lost respect for him as a gang 'leader.' Also, the dialogue and results became too repetitive after a while and the chapter titles gave away too much that I saw everything coming five miles away. Now for the likes. This was an easy read and it introduced me to one of my favorite quotes. This was my first Christian romance novel and I didn't mind the religion as much as I did the rest. I have the utmost respect for the main female character since she accepts her religion with pride and isn't close-minded, like many Christians I know. This character embodies everything religion should be and it was a breath of fresh air to read about it. I loved that the male lead was looking for redemption since I have a slight weakness for those sorts of things. Glad I gave this a shot! I really, really enjoyed this book. “Where Shadows Lie” continues the story of the characters from “Holding the Future Hostage,” but where Tialla Rising’s first novel was a sci-fi adventure, her second book branches out into a more realistic world and a deeper, more thrilling, and even romantic story. Things I loved about the book: The characters. I found them to be real and individual, and I was drawn into the story because I was feeling along with them, cheering for them. And, at least once I really, really enjoyed this book. “Where Shadows Lie” continues the story of the characters from “Holding the Future Hostage,” but where Tialla Rising’s first novel was a sci-fi adventure, her second book branches out into a more realistic world and a deeper, more thrilling, and even romantic story. Things I loved about the book: The characters. I found them to be real and individual, and I was drawn into the story because I was feeling along with them, cheering for them. And, at least once, I wanted to knock them in the head with a two by four in hopes of perhaps putting some sense into their head. :) The action. While this book deals with more serious themes than the author’s first book, the action is certainly not lacking and kept me turning the pages. The depth. Not only did “Where Shadows Lie” entertain me, but it also encouraged me and spurred me on with a message of hope. The romance. Finally, a romance that is clean and entirely appropriate! What a breath of fresh air! Overall, this is a great read, both entertaining and inspiring! It is obvious that the author has grown tremendously and improved her writing style since the release of her first book. I’m hoping for and looking forward to more from this author! LOVE IT!!! This book sports the same characters as the last book, but written in a different style! I was captivated! What a unique love story! I picked it up the day I got it and could not put it down! I had to know what happened at the end! I was quite pleased with the entire book! Thanks Tialla for another amazing read! I absolutely loved this book! I couldn't put it down. The characters and plots were developed beautifully in the story. I thoroughly enjoyed the action, drama, and suspense. The Gospel story was portrayed well, one character in particular received Salvation. I will definitely recommend this book to my friends.